In this post I’ll share some of the things I’ve learned about hair porosity. Porosity is an important aspect of caring for afro hair. It will help you determine how to care for your curls, from your hair care regimen to the moisturizing products you use and how you use them. When I first transitioned, I knew nothing about the composition of my curly hair so I ended up spending far too much money on products that just didn’t suit my hair. Knowing a little about how your hair works will help you grow and maintain long, healthy black hair. Hopefully it’ll also save you from becoming a product junkie and help you tailor your products to the needs of your hair. The porosity of your hair is all about the amount of water – or product – hair takes on and retains. And for natural curlies with thirsty afro hair, the whole battle is about keeping our hair moist. All hair takes on a certain amount of water, but the amount of water that penetrates the cuticle of your hair can vary. The cuticle is the outer layer of your hair and is there to protect the delicate inner layer of your hair, called the cortex. 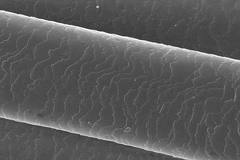 On healthy hair the cuticles lie flat, each one overlapping the other to shield the cortex. If your hair is damaged and the cuticles are raised, your hair will be more porous and water will penetrate it easily. Both highly porous hair and low porosity hair present their own challenges. If you’re lucky, you’ll have normal porosity hair, which both takes on and retains just the right amount of water to keep your hair looking and feeling healthy. A simple porosity test should tell you whether you hair is porous or not. Take a clean strand of hair from your head and put it in a bowl of water. Leave it there for a while to see if the hair sinks or ‘swims’. If your hair is still floating on the surface of the water after some time, you most likely have low porosity hair (I left mine for 24 hours and it was still floating!!!). If your hair strand has sunk to the bottom, you probably have high porosity hair. The hair has absorbed water and become weighed down, causing it to sink. So if you have very porous hair and it’s taking on lots of water, that’s a good thing, right? Wrong! If your hair is highly porous, although water can permeate the hair, it also means that the water can escape easily. Whatever water (or product) your hair takes on, it will lose just as quickly. If your hair has high porosity, you’ll notice that your hair dries almost as soon as you step out of the shower.What’s more, black hair with highly porous strands tends to suffer from breakage. It holds too much water, which weighs it down and puts undue stress on your hair. Hair that’s very porous is damaged. All hair will become more porous over time but often the damage is caused by chemical treatments, heat or over manipulation – so keep this down to a minimum. The best way to deal with high porosity hair is with deep conditioning treatments to nurse your hair back to health. You can temporarily treat damaged cuticles with protein treatments – deep condition and use leave-ins with protein in to repair and rebuild the cuticle (although you can never fully repair the cuticle once it’s been damaged). Because your hair’s weak and prone to breakage, take extra care when brushing your hair – or don’t brush it at all. Finger comb it to get rid of any tangles. You may also find it easier to comb highly porous hair when it’s dry, as this type of hair is more vulnerable than ever when it’s wet. With low porosity hair, it will be difficult for water to penetrate the hair shaft in the first place. The cuticles will be smooth but because they’re so tightly concentrated, it’s very hard to get moisture into the hair. With low porosity hair strands, you’ll notice that even when you’re under the shower it seems to take forever for your hair to become drenched with water.Products sit on top of your hair instead of being absorbed by the hair strands, so even though you moisturise your hair to death, you’re still plagued by dry hair. And it takes forever and a day for your hair to dry..it just drips all day long! With low porosity hair, trying to get moisture into the hair is the key. This can be tricky, but I find that co-washing helps. The warm water helps to open up the cuticle so that I can get moisture into the hair. You can manipulate the cuticles using hot water to open them up and cold water to close them again. Open up the cuticle so that you hair can absorb moisture and close them again afterwards. You can also open up the cuticle with alkaline products such as glycerin. When you’ve applied your favourite moisturiser, reseal the cuticle with an acidic product such as aloe vera, which cause the cuticles to contract and close them again, sealing in the moisture. When you’re applying your moisturising product, try drying your hair slightly first. Because your hair can only absorb so much product, if your hair is still wet it won’t be able to soak up the product in addition to the water on your hair. Deep condition regularly with a heat cap so the heat will help the product penetrate your hair – or treat yourself to a regular steam. With low porosity hair, using heavy pomades and silicones (which add a layer to the hair) to seal the hair can prevent more moisture from entering your hair and you may have to wash this hair more frequently (at least once a week). Use less product rather than more, because it tends to build-up on the hair and form a barrier to moisture – so piling on more products to moisturise your hair will do exactly the opposite. Remember: nobody knows your hair better than you do! Your own hair will let you know what’s working and what isn’t, regardless of what other people say. Use trial and error to establish a hair care routine that suits your ‘fro. Do you have porous hair? How do you handle it? Please add your thoughts and comments below! If you need advice or support on black hair care, join the Natural Hair Forum UK. If you think you could share some knowledge about afro hair, please join the forum and help other natural curlies achieve healthy black hair. Get involved at www. blackbeautyhaircareforum.org.uk. Next post…everyday natural products you can use to moisturise black hair.